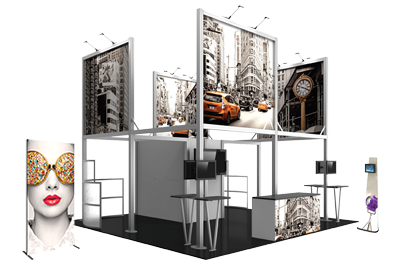 Monopolize the tradeshow floor with the bold, sophisticated presence of Formulate® Fusion Kit 09. Standing 14' tall and over 10' wide, the L-shaped exhibit structure features a rooftop that extends 18' into the exhibit space. This main structure is comprised of an aluminum tube frame, coupled with pillowcase fabric graphics. This main fabric structure is structurally supported by a freestanding laminated counter that is 7' 10.5" wide by 3' h by 2.5' deep, providing plentiful secure storage and countertop space. Two structural walls are positioned at 45 degree angles in the space and stand 11' tall by 5' wide, with a depth of 1.5'. The rectangular structures combine heavy duty aluminum extrusion frames with push-fit fabric graphics, which are designed for bold, vibrant graphics and messaging! A freestanding laminated reception counter establishes the area for exhibit staff to meet and greet guests. *For more detailed information, reference the instructions and/or graphic template.